This morning, 9:30 AM. Hardly anyone there. We were the only ones voting at the 15th District. I was #48, Hubby was # 49. Some really nice people and neighbors were glad to see us! We use mechanical machines where I vote. "Don't forget to pull the lever to the right when you're finished!" I should have taken a photo inside the booth pulling the lever for Obama! 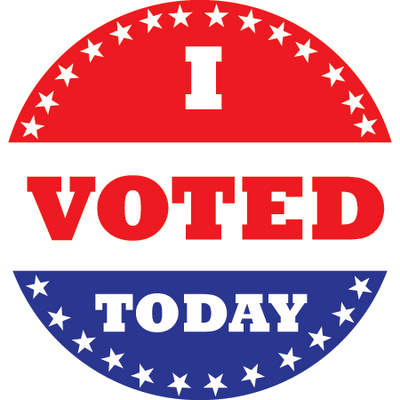 Two people I asked if they voted said they hadn't, and didn't intend to. Yikes! I hope not too many people felt like that! Don't forget to go over to Forks of the Moment for a live blogging, election updates and commentaries. See you there! ... at our polling place they wouldnt let me take pix indoors .. didnt matter and we too use the 'pull the lever' machines..
Good for you. Voting early worked for me. It’s been a crazy day thus far. 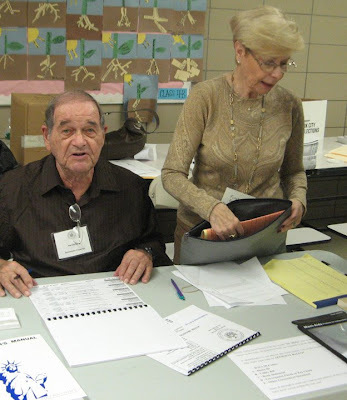 I didn’t realize they let you take cameras into the polling place. As for the ‘Obama Wins’ post … we’ll all be watching the returns and HOPING that’s what happens. Like I've told a few in blogland, and my hubby....I am as nervous as a whore in church. Nervous to finally, FINALLY hear some polling results when the first of the many polls close. I have a bottle of champagne chilling overnight tonight, if all goes well and the win is a landslide for my choice...we're having a champagne breakfast!!! We use machines where we turn a dial and push a button to make our selections ... and before the we cast our vote there's a paper print out we can examine. Brings back memories, Mary... I thought New York had gotten rid of the old lever machines. Sad to hear that turn-out is so low. That's disturbing, but one of the dangers of this stupid electoral college system where many of us become sort of the "forgotten" or "taken for granted" voters. I voted absentee a while back. I kind of miss the visceral thrill of doing it live. Nice to see the photos. America at her best, thrills me. I don't think any of my neighbors voted. They would, by and large, have cast votes for McCain so I'm not totally sad about it. you look as happy as I did! and hootin' anni kills me, how is it I didn't discover her sooner! Oy! In our smallish town, my vote took five minutes in total. 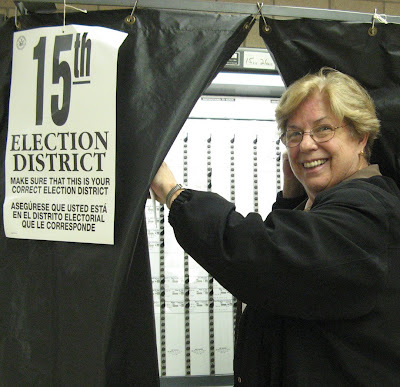 In CT, they have gotten rid of the lever machines, and now use optical scan machines, so tou just fill in the bubbles and feed the machine the ballot. 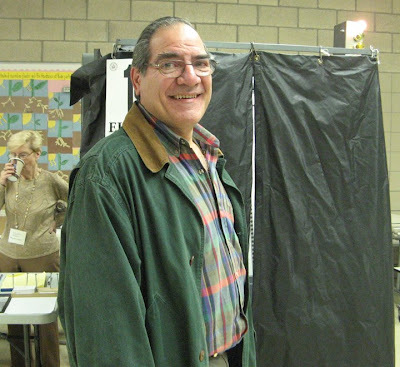 It works well, and there was even a low table for wheelchair voters to fill out the ballot - it was nice and easy. Feels good to vote! Nice to see pic's of you and your hubs. We voted, too, of course. I took a couple of photos inside but they were blurred. We have the touchscreen although we could have requested a paper ballot. I thought of taking my camera..you know.....for blogging purposes but forgot. Hubby said I probably wouldn't have been allowed to use it anyway. 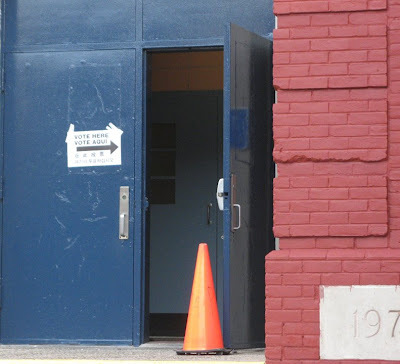 We had no camera or cell phone use signs up at our polling place. 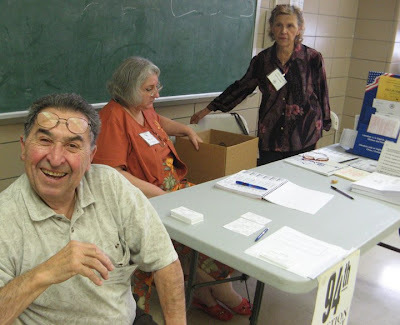 We use paper ballots in Michigan, where you use a felt tip pen to connect an arrow. Pretty archaic in my opinion. But no hanging chads. We had paper ballots and I was very careful to color inside the bubbles. I just saw a flash that Virginia was nearly a dead heat.